While being car-less in the city is quite common these days, it definitely becomes a nuisance when it becomes time to purchase a Christmas tree. Because when you’re car-less, you become ‘that guy’ who has to lug a massive Christmas tree onto the TTC or into an Uber, spilling pine needles wherever you go. This is why a Christmas tree delivery service in the city is a holiday miracle. And this year in Toronto, it’s actually a thing. Starting on November 21 through until December 22, you can let Inabuggy do the heavy lifting for you by delivering you a Christmas tree right to your front door. 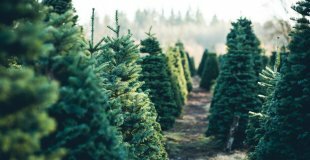 The delivery app and online service has partnered with Toronto’s Beech Nursery to deliver Torontonians three types of freshly cut and wrapped Christmas trees including Balsam Fir, Fraser Fir and Pine trees. For condo-dwelling residents, the Balsam fir and Fraser fir are also available in smaller sizes to accommodate smaller units. Tree delivery is available on Wednesdays and Saturdays between 8 am and 5 pm and prices range from $34.95 to $149.95 with an additional $9.99 delivery fee for customers living between St. Clair, Coxwell, Lakeshore and Dufferin. Neighbourhoods living outside of those boundaries will have to pay a $19.99 delivery fee. Shoppers can also purchase a Christmas tree stand and tree accessories, such as garlands.